Christopher Baker, a photojournalist and leading guide for National Geographic Expeditions, as well as a popular guide for motorcycle and photography tours to Cuba. His books include the Moon Cuba guidebook, Mi Moto Fidel: Motorcycling Through Castro’s Cuba, and Cuba Classics: A Celebration of Vintage American Automobiles. Bob Guild, vice president of Marazul Tours, Inc., founded in 1979 and one of the original Cuba travel agencies. He is also a coordinator of the new professional travel association RESPECT—Responsible and Ethical Cuba Travel. Collin Laverty, founder and president of Cuba Educational Travel, one of the leading travel providers of cultural and people-to-people tours (including The Nation magazine’s) to the island. With its mission “to connect the people of the United States and Cuba,” CET has also facilitated the travel of Cuban dance troupes, hip-hop artists, students, and entrepreneurs to the United States. Sandra Levinson, a founder and executive director of the Center for Cuban Studies in New York. Since 1973, the center has organized hundreds of professional tours to Cuba oriented toward artistic, cultural, and sociopolitical interaction. Peter Kornbluh: In one way or another, you are all pioneers of, and participants in, the evolution of travel to Cuba over many years. After decades of travel bans, what was most important about this past year, after President Obama’s history-making decisions to authorize direct commercial air flights and cruise ships and allow individual US citizens to visit the island on self-designated “people to people” and educational trips? CL: Finally, there was a sense of normalcy in traveling to Cuba! Americans finally felt like it was OK, normal, and legal to book a flight and go. That psychological element has had a tremendous impact on how many people actually visit the island. President Obama led by example when he visited Cuba last year with his whole family. He sent a message that we should visit, engage, and make friends as well. CB: It’s hard to underestimate the impact of Obama’s travel opening. First, the increase in the volume of US citizens in Havana—the prime destination for Americans—was noticeable, including for the first time the arrival of a significant body of African-American travelers and younger independent travelers, including spring-breakers. There’s no doubt this has been a godsend for Cuba’s burgeoning private entrepreneurs, notably owners of private-room rentals, but also artists and, of course, owners of convertible classic cars. CL: That’s right. Obama’s relaxed travel regulations promoted organic and unfettered interaction between visiting Americans and Cubans. The country’s safety, combined with the openness of the Cuban people, meant Americans were getting off the beaten track and spending time with average Cubans. Additionally, the growing private sector in Cuba improved its products and services to receive increased numbers of Americans, leading to great economic growth and innovation to adapt to new market conditions. BG: This last period of time was certainly unlike anything I had experienced since first sending groups to Cuba in 1977! The fight for our right to travel has always met fierce resistance, including violence, bombings, and murders. Last year we seemed to be winning—but then came Trump! PK: What do you think will be the impact of Trump’s new restrictions? SL: I think we’ve already seen some of the impact. What Trump has done, despite its being mostly smoke and mirrors, is make people think that, once again, it is going to be difficult to travel to Cuba—that there will be hoops to jump through. Trump’s message is that our government doesn’t like the Cuban government, and that going to Cuba might mean trouble with the US government’s Treasury Department. Travel to Cuba is now a kind of no-no—at least rhetorically. CL: I completely agree. The new restrictions are going to reduce the number of Americans traveling to Cuba. The rhetoric surrounding the announcement about audits, fines, and banned hotels scares law-abiding Americans who don’t want to look over their shoulder for going on holiday. Moreover, it will affect Cuban entrepreneurs serving visiting Americans and the average Cuban worker in the hospitality sector, which survives off tips. Americans happen to be the best tippers in Cuba at the moment! BG: While Trump trumpeted his so-called support for the private sector in Cuba, his approach is actually a frontal assault on the owners of private restaurants, bed-and-breakfast homes, and on Cuban artists who have depended on US travelers in the “individual people to people” category for a disproportionate share of their sales and sustenance. And any lessening of group travel due to revised rules and threats of “audits” will also negatively impact the entrepreneurs whose privately owned businesses are increasingly incorporated into group programs and arrangements. CB: I recall when Presidents Obama and Castro announced the accord on December 17, 2014, and Cubans erupted in spontaneous cheers on the street. I was in Cuba the week after Trump’s announcement, and the mood was far less sanguine. Almost every Cuban I met expressed concern that Trump’s setback will harm their pocketbooks as well as US-Cuba relations. Cubans want warmer relations. They delight at having US visitors, whom they welcome with genuine smiles and expressions of affection. This comes from the heart, not necessarily from the fact that US travelers are big spenders. PK: Well, let’s talk about broader US-Cuban relations. Besides restricting travel and future US business ventures in Cuba, Trump has clearly abrogated the foundation of the 2014 accord to pursue normal, civilized relations with the Cuban government of Raúl Castro in favor of a return to an imperial, bullying policy approach. BG: For most of the past 50 years, the US government, under both Democrats and Republicans, has maintained a policy of regime change toward Cuba—implemented via invasion, assassinations, sabotage, the economic blockade, and through millions and millions of dollars spent on subversive programs funding programs run through US AID, Radio and TV Martí, and other agencies. Finally, after more than half a century, President Obama recognized the sovereignty of Cuba and its government and Cuba’s right to determine its own future. This was no small victory for Cuba and the vast majority of the people of the world who supported Cuba. Obama announced his opposition to the “embargo” and he opened travel as much as he thought he could do without Congressional action. Then on June 16, Trump renounced this historic change and resumed the policy of regime change—emphasizing his support for the economic blockade and extending the travel ban. I believe we must add this to the list of historic horrors from Trump. SL: Obama was making a huge difference psychologically for the people of Cuba, and those in countries that relate to and admire Cuba. For the first time, they were being treated almost equally to the big guys. The affection shown Obama by ordinary Cubans was completely out of proportion to what he was really accomplishing. But it meant the world to Cubans—and the fact that Obama arrived in Cuba with his family suddenly made every norteamericano seem within reach. Cubans in the street were like butterflies coming out of their cocoons, or flowers opening to the sun—they seemed so grateful to at last be treated with decency. Now, what Trump has done is destroy that beautiful, fragile awakening. The way Trump spoke, lectured, and lied about Cuba in front of his fawning right-wing Cuban-American audience was truly sickening, and hurtful for the Cubans who were so ready to believe in change. CB: Trump’s move is purely cynical and has zero positive benefit. It’s clearly a backroom deal with Florida Senator Marco Rubio to serve the latter’s emotionally driven distaste for open relations with Cuba, and because Rubio sits on the Senate Intelligence Committee investigating the Russian connection. Trump’s policy sets our relations back throughout the hemisphere. Plus, Cuba understandably refuses to negotiate under duress. Trump now makes it more difficult to advance bilateral negotiations on a wide range of topics of mutual interest and benefit. CL: And there is another issue: Cuba is undergoing its most important transition in 50-plus years, as Raúl Castro and colleagues from his generation will step aside and a new set of leaders will take place. This coincides with an ongoing economic reform process and significant changes in Cuba’s international relations (e.g., with Venezuela and Brazil). The United States has the opportunity to be an ally and an influence in this process of change rather than an enemy and impediment. What President Trump has done is make things more complicated for those inside Cuba who are pushing to turn the page. PK: Trump’s Treasury Department is currently writing new regulations that will govern how people can go to Cuba and where they can and cannot stay and spend money while there. The new regulations will include a list of hotels, shops, tour buses, and other businesses that are administered by the Cuban military-led Business Enterprise Group (GAESA); those will now be off-limits to US travelers. Presumably the new regulations will also detail how the Trump administration plans to “audit” travelers and prosecute them if they violate the new restrictions. What do you see as the best-case and the worst-case scenario? CL: A worst-case scenario is that the Treasury Department’s interpretation of military-related companies is exaggerated to the point that a majority of the hospitality sector in Cuba becomes restricted, making it near impossible to visit the country without violating the rules. Hard-liners in Miami would like to see this happen, but it appears that sobering voices inside the White House have encouraged a balancing act that won’t hurt US airlines, cruise companies, and other economic interests. At the end of the day, the money from GAESA entities goes to Cuba’s federal budget, just like the money from non-GAESA entities. The idea of pushing US tourists from the GAESA-run Hotel Saratoga to the non-GAESA Hotel Nacional will have absolutely no practical implications. CB: Certainly, Trump could have walked back the travel and trade restrictions much further. But the devil is in the details, which we won’t know the full impact of until the new regulations are actually published. The best-case scenario is that the restrictions will continue to permit group people-to-people programs to utilize GAESA-run hotels and facilities via third-party entities, and that only independent travelers will be restrained. This isn’t wholly bad, as many such group experiences provide for a more whole understanding of Cuba (a very complex nation to comprehend! ), such as on my own motorcycle and photography programs and those I lead for the National Geographic Expeditions. PK: Determined travelers have been protesting, and circumventing, the travel restrictions to Cuba for decades. What is your message to US citizens who want to assert their right to travel to Cuba in the future? BG: From the very first announcement of travel prohibitions to Cuba, in 1961, thousands of people have come forward to challenge the restrictions, among them student delegations, women’s groups, trade unionists, and of course the Venceremos Brigade contingents and Pastors for Peace Caravans, which challenge the ban every year—including this July and August. But now, the groups opposed to these restrictions are so much larger and diverse than ever before. In 2016, more than 600,000 US citizens visited Cuba. Polls indicate 75 percent of the people in our country—including majorities of Cuban-Americans and Republicans—are opposed to any restrictions on travel. Multinational companies and trade groups, travel agencies and tour operators, cruise ship and airline companies, all lobbied Trump prior to his announcement to keep the door to travel open. Our job now is to reach out to past and current travelers, and to those who want to visit Cuba in the future, to join in an organized campaign to pass the “Freedom to Travel to Cuba Act”—recently introduced with 55 Senate co-sponsors—to finally end all the restrictions on travel, as well as other legislation to finally lift the economic blockade. SL: We must organize to oppose Trump’s policies and the mentality behind them. Every single person who has traveled to Cuba should be writing his/her congressperson, calling offices, protesting what Trump has done. I hope our phones, Facebook, Instagram, and the rest of social media hasn’t turned our legs to jelly and that we can still participate and not just observe and comment on what others are doing. In short, we must resist. But I would also remind everyone that individuals can still travel to Cuba legally if they’re professionals going for professional reasons, if they’re going for religious reasons, or humanitarian reasons, or attending conferences…in other words, if they fit into one of the 12 categories of exemptions to the travel prohibitions. If they don’t fit into one of those categories and they hate group travel, they might go (illegally) through Mexico, Panama, Canada, the Bahamas, or the Dominican Republic. If they’re smart, they’ll travel with one of the terrific tours planned by The Nation or the Center for Cuban Studies! What’s challenging about that option, however, is the cost—we have to work on that with our friends in Cuba so we can make it possible for people without much money to learn about Cuba. The hotel prices will have to come down, and the casas particulares will have to be made more available to groups. 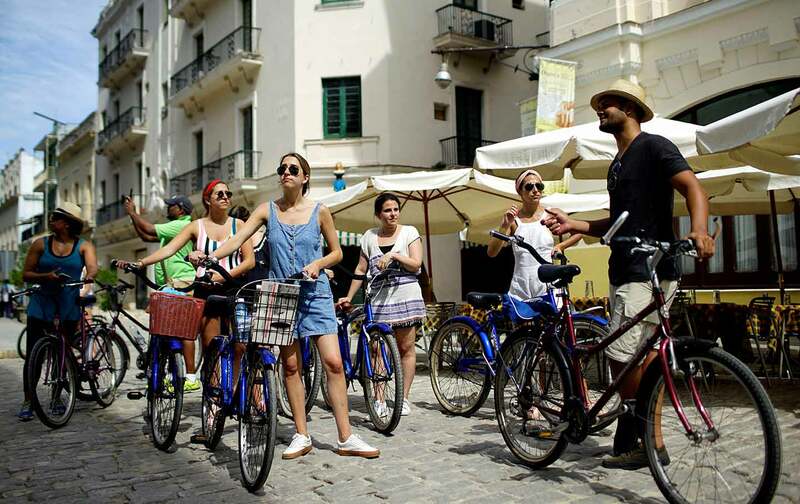 CB: Independent travelers have always sought to sidestep legal restraints on travel to Cuba. During the past few years this has been facilitated by the Treasury Department’s Office of Foreign Assets Control’s turning a blind eye. But Trump has now instructed OFAC to police travel more assiduously, and while he specifically focused on ensuring that people-to-people travelers are in compliance, undoubtedly there will also be stepped up policing of illegal travel via third countries, as happened in the George W. Bush era. To be safe, travelers interested in visiting Cuba should do so with an organized people-to-people program. The range of options has expanded in recent years to suit every budget and taste. CL: Here is the message: It’s OK to visit Cuba! Even with Trump’s new restrictions, a full tour is not the only way to do it. There are many options that are cost-effective and flexible on the ground in Cuba. Reach out to a specialist for advice, compare options, read the regulations, talk to friends who have gone, but ultimately, go ahead and go. It is worth it!